﻿Recruitment and settlement of sessile marine organisms onto artificial substrata suspended in water column within the Fal Estuary. Three sets of panels were deployed in Falmouth Harbour between 17th of January 2014 to 13th of May 2014; each of the sets was composed of three different panel material (marine plywood, polypropylene, aluminium). The aim was to investigate whether the composition of the different substratum would influence the recruitment, settlement and development of the sessile invertebrates in period of time. It was predicted that the composition of the substratum would influence the recruitment, settlement and development of the sessile invertebrate’s assemblages. Assemblages on marine plywood and polypropylene were slightly different from those on aluminium, patterns between all their surfaces depended on the orientation and positioning of the panels. The taxa that dominated these surfaces had some resemblance in identity to those on urban structures of the same composition, and the abundance was simply depended on the period duration in which they could settle and attach themselves and other factors involved including the weather patterns, sea state condition (the storm) and season. Understanding the role of artificial surfaces as substitute habitats for natural surfaces is critical. The structure of habitats has been considered important in various studies in the determination of the number, identity and abundances of species present in biological communities (Abele, 1974; Menge and Sunderland, 1976). One feature of the habitat structure is the type of substratum i.e. the type of the material from which the habitat is made. A variety of types of artificial surfaces have been used as surfaces for settlement as they are manipulable and easy to use. The results of these studies suggest that different substrata can be expected to affect settlement (Crisp and Ryland, 1960; Cuomo, 1985; Russ, 1977; Walters and Wethey, 1996) and subsequent development of intertidal and subtidal assemblages (Anderson and Underwood, 1997; Butler, 1991; Keough, 1984; McGuinness, 1989; Walters and Wethey, 1996). Few studies have specifically addressed the effect of urban structures on subtidal epibiota (Glasby, in press). It has been suggested that the creation of new habitats through urbanisation not only increases habitat diversity, but this in turn causes an increase in species diversity (Rebele, 1994). In some instances, an increase in habitat diversity has actually decreased the number of species in an assemblage and/or the abundance of individuals (Heck, 1979; McGuinness and Underwood, 1986). Anderson and Underwood (1994), illustrate how many species including barnacles and oysters recruit in larger numbers on concrete or plywood than on fibreglass or aluminium. Pontoons benefit by being isolated from the seafloor, decreasing the chances of benthic predation, (Connell and Glasby, 1999 ; Holloway and Connell, 2002). A multivariate analysis showed assemblages on different substrata were significantly different after 1 or 2 months of submersion, but became more similar after longer periods. Thus is indicating that the nature of the substratum can affect both initial colonisation of particular species and the development of the assemblage over time. Thus is indicating that the nature of the substratum can affect both initial colonisation of particular species and the development of the assemblage over time. The report for Natural England outlines that the highest risk marine invertebrate species to threaten the UK shoreline is the colonial ascidian, Didemnum sp, which has been black-listed because of its successful colonisation along the British coasts. 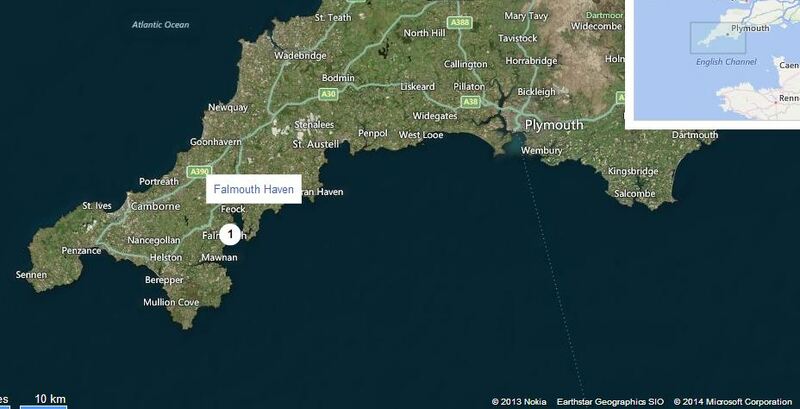 The location of this study was conducted within the Fal estuary (Figure 1, 2 & 3), at Falmouth Yacht Haven. Estuaries are of commercial and recreational importance throughout the world as they are valuable environmental, ecological and economical bionetworks. Due to their commercial use estuarine environments, experience significant amounts of anthropogenic pressures such as environmental degradation, pollution and industrial development (Underwood and Kromkamp, 1999). ﻿Falmouth is the largest town situated on the banks of the Fal estuary, also is one of the deepest natural harbours in the world and is therefore used by international cruise liners and large numbers of pleasure craft due to the harbour’s 588 moorings (Falmouth Harbour Commissioners, 2007). Falmouth’ recreationally and commercially important dockyards and marinas, has led to great abundance of man-made artificial surfaces in the harbour; i.e. ship hulls, buoys, pontoons, moorings and docks, which all present an immense area of substrate (Arenas, et al., 2006) for fouling organisms such as the invasive, Asterocarpa humilis commonly known as Compass sea squirt which is indigenous to the Southern hemisphere. 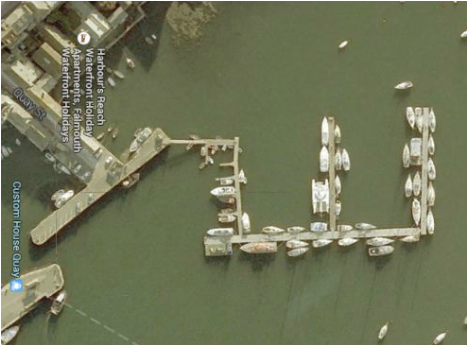 Figure 2: Shows the aerial, bird’s view of Falmouth Yacht Haven. Blue circle shows the area where the 3 sets of panels were set. The harbour is commonly frequented by recreational yachts, naval/fishing vessels, and cruise liners; the construction of a submarine pier in 1892 suggests other, invisible harbour patrons may still visit (Falmouth Harbour Commission, 2007). The land around the harbour is also used for agriculture and livestock farming, this is the case throughout the Fal estuary and it produces high nutrient run-off, increasing the nutrient levels in the water and facilitating the growth of primary producers. The south-west of UK is a particularly highly productive area and the water sitting over the continental shelf is shallow, which improves mixing and the Gulf Stream brings warm, equatorial water which helps to maintain a climate more temperate than the latitude would normally allow (Rykaczewski and Checkley, 2008).